In just over a month OUSD will announce plans to address what they have identified to date as a $30M structural deficit. Simply put – the district’s expenses are increasing while revenues are flat. If the district does not make budget cuts, they risk take over by the county or state. Smarter spending is an opportunity to invest in what is most helping students. All cuts must demonstrate a “students first” approach, including redesigning a smaller and leaner central office and maximizing dollars to school sites. Fixing Oakland’s school budget will be hard. But failing to fix it will be harder. The district must make the necessary reductions to avoid bankruptcy and avoid a state takeover. Last week, I was surprised to learn that some Oaklanders are receiving inaccurate information. They’re hearing that OUSD does not need to make budget cuts and may even have a surplus. This information is misleading, and can be harmful if it divides the community by debating the problem rather than working together on solutions. 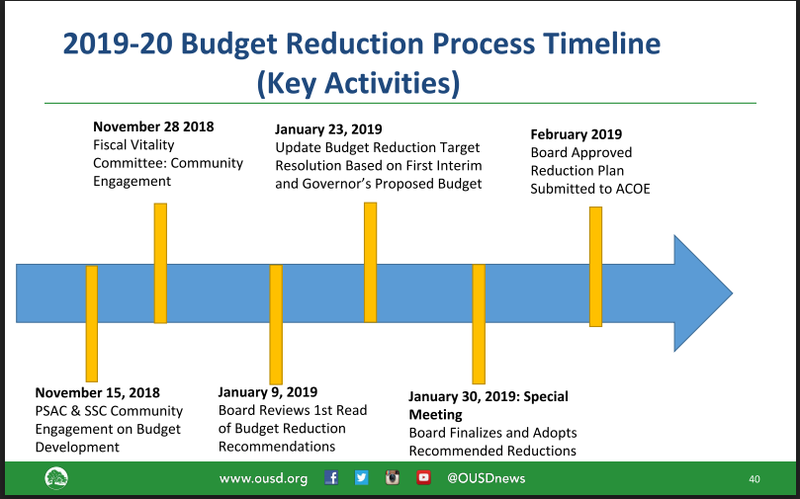 The reality is that OUSD does have a budget problem, and has announced the need to reduce spending by $30M over the next three years, or risk county and state takeover. To clarify, I made a quick video to explain what’s really happening: OUSD Current Financial Reality and Next Steps. Check it out for a breakdown on these complex issues. What has OUSD done to develop a plan? The school board has…launched the Fiscal Vitality Committee and have developed a set of draft recommendations for how they want the district to implement these reductions. These recommendations include redesigning a smaller district central office and increasing employee compensation. The message has been clear from the board – use the reductions as an opportunity to rebuild a leaner central office from scratch. The district staff has…not exactly demonstrated follow-up on the board’s direct requests for plans that transform district spending patterns. To date, the the district budget reduction plans have followed a worrisome approach of making across-the-board cuts to all central office departments and proposing the remaining cuts happen at school sites. Our concern here is that the district will be left with a large and ineffective central office, with departments experiencing too many cuts to achieve their goals. The alternative, supported by the board, is completely cutting some departments or programs, while prioritizing spending for other areas that have the highest demonstrated impact on student outcomes. GO recommends…that the Superintendent and finance staff follow through on the Fiscal Committee’s requests to really demonstrate that every possible cut has been made to restructure a lean central office before making any decision to reduce school site budgets. Prioritize funding school sites by demonstrating that every possible dollar follows students. Redesign central office by transparently going through each department and program and limiting funding to legal requirements and a limited number of strategic initiatives. Measure Impact by establishing clear goals that demystify the work of the central office and demonstrate impact on student outcomes. At the December 12th school board meeting, OUSD will look at how their spending is going so far this year (1st interim report) and have the best new number of how much they need to cut for the future. GO will provide an update as soon as that information is shared. The most direct way to share your voice is by attending a committee or board meeting and speaking directly with the school board and district staff. The decisions made in December and January will shape the future of OUSD for years, and it is critical that our district leaders hear how important it is to you that we stay out of state receivership and prioritize smarter spending for Oakland students. I will be attending the following meetings and invite you to join me! 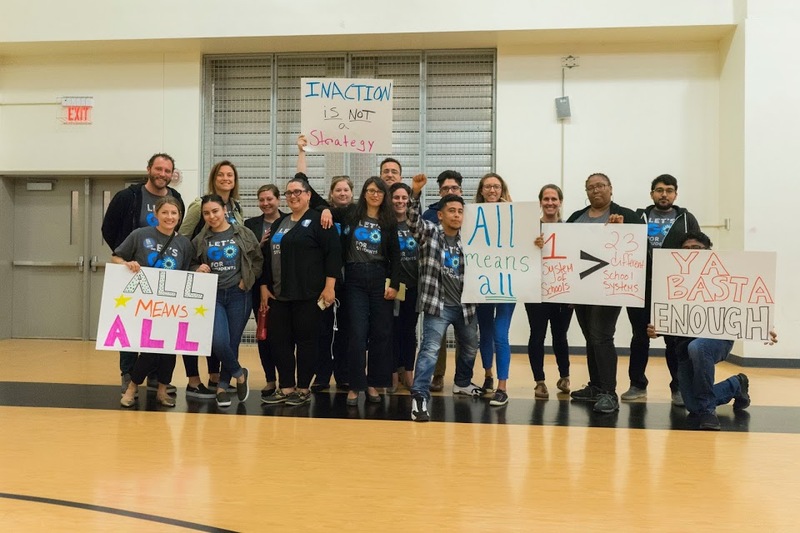 GO will continue providing updates and analysis that engage community members on the urgency and complexity of the financial decisions facing OUSD. Subscribe to receive our budget updates and sign up here if you would like me to come out and host a budget info session for your school group, community organization, neighborhood group, or other gathering of Oaklanders.